Grandma de Groot used to make these on occasion, as did my Mother, so I’ve taken up the tradition and make them for my family whenever I have time, apples, beer and deep frying oil. You can eat them as dessert, either on their own or with ice-cream, or be quite devilish and have them for Breakfast! 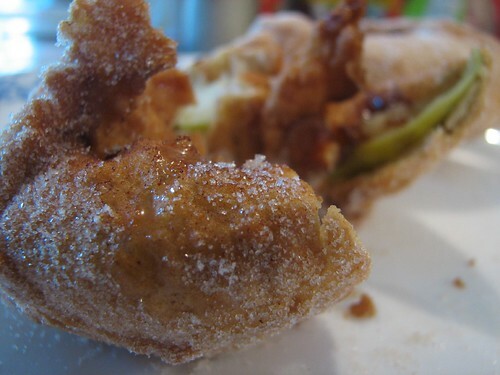 * Apparently not Appelflappen in the modern world, rather an Appelbeignet, although other sources refer to them as Oudhollandse Appelflappen, signifying they may once have been called Appelflappen and the term has changed over time. 6 large Granny Smith apples, peeled, cored and sliced longitudinally 1cm thick. caster sugar and optionally Dutch cinnamon. Combine the flour, beer and salt in a large mixing bowl and stir well until you have a smooth batter. Coat apple slices a few at a time with batter and deep fry until light brown (3 to 4 minutes). Drain on paper towels and then coat with sugar (or sugar/cinnamon mix).